Thought to be one of the oldest tart varieties, the Austrian linzertorte is known for its crumbly pastry flavored with cinnamon, lemon zest, and nuts, and for its bright jam filling. This more portable — but just as elegant — cookie version is made of two almond flavored cookies sandwiching a layer of sweet-tart raspberry-lemon jam. In its purest form, vanilla powder is just ground up vanilla beans. You may also find it labeled as ground vanilla. For the cookies, beat butter with a mixer until smooth. With mixer running, gradually beat in powdered sugar until light and fluffy, 3–5 minutes. Combine flour, almonds, vanilla powder, salt, cinnamon, and cloves; gradually beat into butter mixture just until blended. Divide dough in half and wrap each in plastic wrap; chill no longer than 30 minutes. Roll each dough half on a lightly floured surface to &frac18;-inch thick. 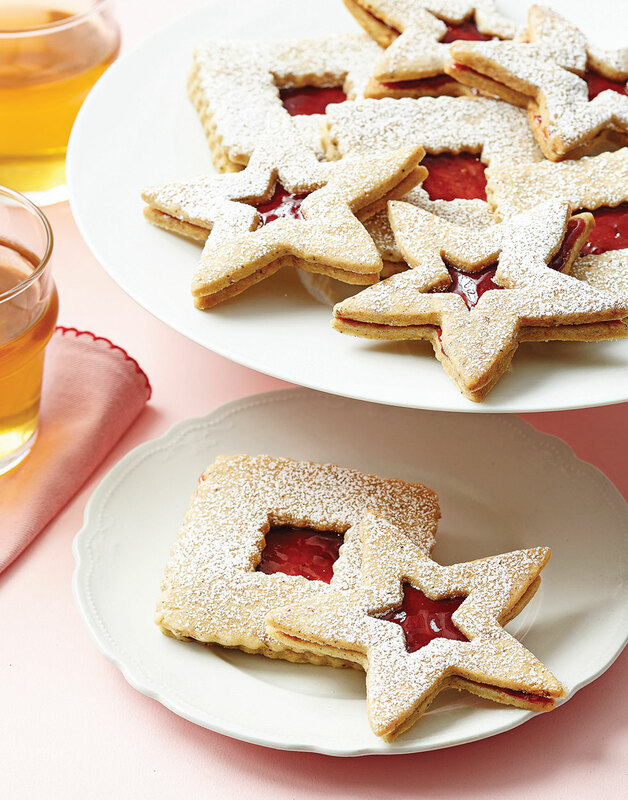 Cut cookies with a 3-inch cutter, then cut out centers of half the cookies with a 1½-inch cutter; transfer cookies to prepared baking sheets. Reroll scraps once. Bake cookies until golden, 15 minutes; let cool on baking sheets 1–2 minutes, then transfer to racks to cool completely. For the jam, stir together jam and zest. Sprinkle hollow cookies with powdered sugar. Spread ½ tsp. jam mixture on solid cookies. Sandwich solid cookies with hollow cookies, then fill centers of layered cookies with about ¼ tsp. jam mixture. Grind the almonds in a spice grinder until they’re as fine as they can be without turning into almond butter. Use a very thin spatula to transfer cut out cookies onto prepared baking sheets. Wait until cookies cool completely before sprinkling with powdered sugar so it doesn’t melt.